Hermès Eau d'orange verte Eau de cologne spray, 6.7 oz. HermèsEau d'orange verte Eau de cologne spray, 6.7 oz. The founding cologne created by Françoise Caron in 1979 and inspired by the smell of undergrowth moist with morning dew, this fragrance has asserted itself as an emblem of Hermès, and stands out for its distinctive freshness. A novella perfume conceived as an explosion of citrus notes with orange playing the central role between zests and leaves, lemon, mandarin, mint and blackcurrant bud. 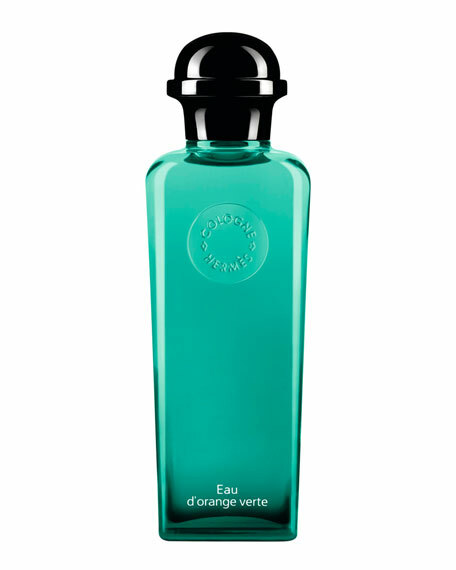 Eau d'orange verte reveals its complexity in a unique sillage comprising oak moss and patchouli. The eau de cologne, the green freshness of an explosion of orange, with a woody signature.